Save 20% off admission for up to six participants at The Room Mystery Escape Challenge in Lisle Illinois. Are you looking for a game that is different and exciting? 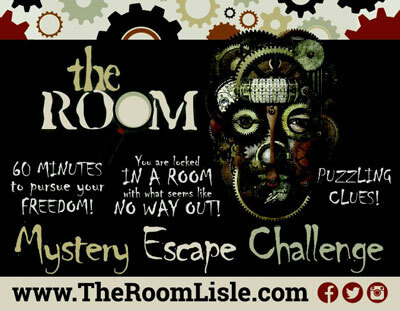 THE ROOM is a live, interactive mystery escape challenge. It’s a great game for friends, family and co-workers who love solving mysteries or puzzles. Couples find THE ROOM to be a perfect alternative to dinner and a movie. Our mystery escape challenge is a fun game for everyone! How about a team challenges for your office, club, sports team or even your family, THE ROOM is great for team-building! Working together to escape THE ROOM in team challenges furthers cohesiveness and tests the detective in all of us.